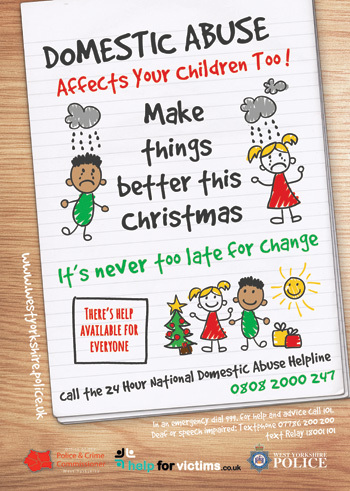 Domestic abuse often increases during the Christmas and New Year period. There’s help available for everyone to make things better. 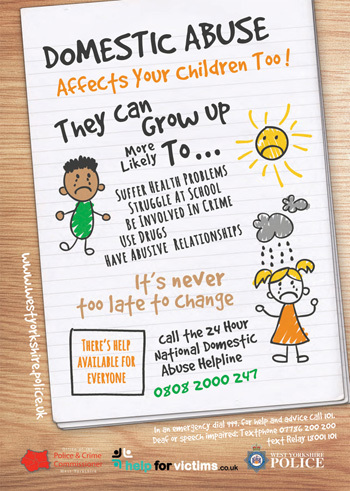 Research has shown that children who suffer or witness domestic abuse may be more likely to become drug users, struggle with their education, suffer health issues, become involved in crime, and that they too may have abusive relationships themselves. Our campaign aims to encourage people to report these often hidden offences, and to seek help from the police and other agencies. 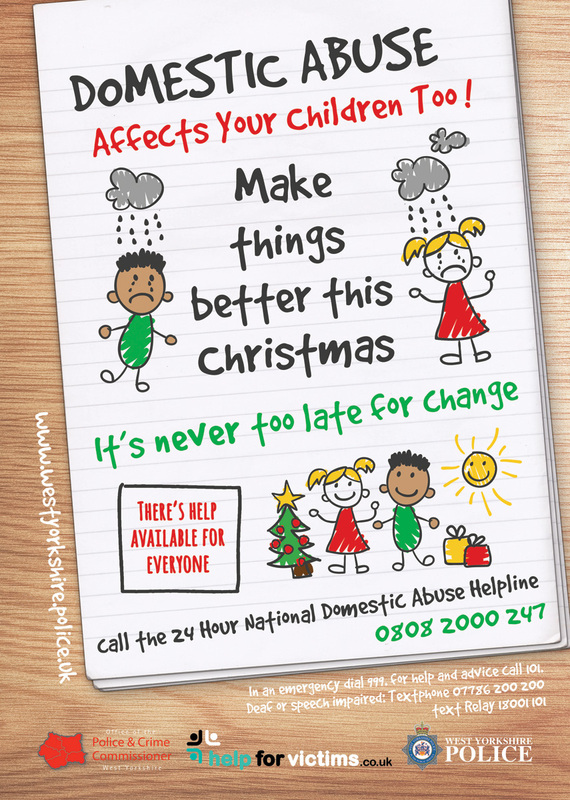 Whether you are a victim of domestic abuse, are worried about someone who you think may be a victim, or are worried because your behaviour can be abusive, there is still time to change and help is available for everyone. Contact details of Police Safeguarding Units across West Yorkshire, where specialist officers are available to speak to anyone with concerns are available here. If you would rather not speak to the police, there are lots of other organisations and charities that you can contact and these are listed here. You can contact the police 24 hours a day, 7 days a week on the non-emergency number, 101. If you are in immediate danger or there is a crime in progress always call 999. Assistant Chief Constable Russ Foster talks about the domestic abuse 16 days of action and explains how the crime can have a negative impact on children. Sandy from Leeds explains what life was like for her when she was a child witnessing her mother being a victim of domestic abuse. As an adult Sandy has also suffered domestic abuse from her partner. The video is of Sharda Parthasarathi from the NSPCC talking about the impact of domestic abuse and giving advice to anyone who has concerns. Professor Brigid Featherstone talks about the impact of domestic abuse on children. Gail Faulkner, Head of Children's Social Work Service Leeds, talks about the work she does in supporting families and children affected by Domestic Abuse. The below audio file is a poem written by Phil Pearce and delivered by Daniel Morton. The poem gives an account of domestic abuse from a child’s perspective. Click here to load large PDF version of Domestic Abuse poster (890kb). Professionals can print off this leaflet (PDF) via the link below and offer it to service users for reference. 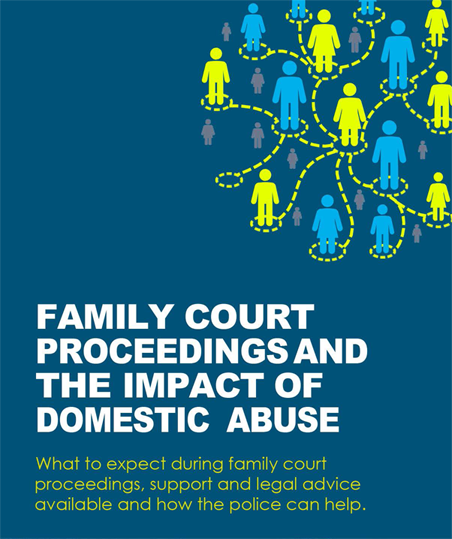 It explains what to expect during family court proceedings, and also what support and legal advice is available and how the police can help.